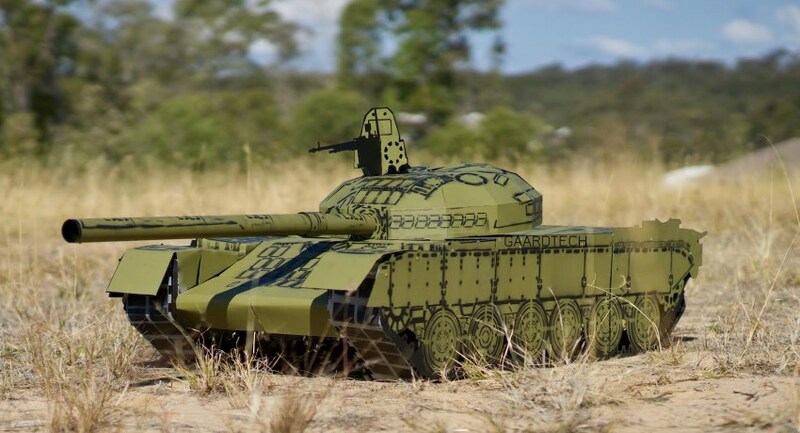 Brisbane-based SME Gaardtech has identified a gap in the market, providing high-quality silhouette, 2D targets, 3D/3D mobile targets, signature and decoy targets for defence training purposes that will transform the way the ADF trains forces in response to key threats. In this edition of 'On Point', Bisgaard will share how GaardTech plans to market its product, the future lines that it plans to develop and why it is choosing to outsource the creation of its products for the time being. He will also explain the rationale behind why the company is hoping to attract a particular type of staff member to join the team, who that is and how that will impact GaardTech going forward. Phil Tarrant: Good evening everyone, thanks for joining us on the podcast. We're going to get to a start-up. We're going to get an SME in the studio today is Steen Bisgaard, he's the director of a company called GaardTech. We're going to have a chat about all these things. Steen, how are you doing? My thanks for joining us. Let's start with what's your background and personal experience? Do you think your particular space where you are right now in business, you're new, and you've only been going for a year or so. We'll have a chat about that but what are you learning? What's the right way to do it? Do you think there's tools out there to help businesses like yours go out there and understand the opportunities in defence and make it happen? Steen Bisgaard: Pretty well Phil, thanks. In my background, I did 10 years in the Royal Australian Armoured Corps in the Australian army. I was Abrams tank troop leader, Armoured Corps, a number of other planning positions, so looking at how do we apply these assets being the Abrams tank, which is my baby, and I think if you ask anyone who's ever worked with tanks, they're obsessed and they really, really are passionate about it and I think it's because we can look back through history and you see the major wars that have occurred. I think there is. There's a lot of great government organisations and also industry organisations that are encouraging people to do it, but the hardest piece is just getting the basic blocks of the company established. Knowing what your product is going to be, who your audience and your customer is going to be, and what problem you're really actually solving. Defining it on what it's gonna do and who it's going to help is probably the most applicable way of getting your message out and really trying to connect with your audience and your industry. Phil Tarrant: Let's have a chat about GaardTech, that's your business. How big is it, how long has it been going and what are you guys doing? Steen Bisgaard: OK, so GaardTech is quite a new defence innovation firm. We refer to ourself as the design firm for now because we looked to solve problems using our end user understanding and the experiences that we had when we were in the military and what would annoy us or what didn't work, where we saw value not really being achieved. GaardTech is based in Brisbane. We are using local manufacturing for our first product line being targets tank and reconnaissance ground enemy target systems and this is a full sized 2D, 3D and 3D robotic advanced training systems, which is going to enable the new vehicle acquisitions through to the new air force acquisitions to really unlock training a joint visual, live fire context. We'll go left of spectrum probably entry cost point. You'll have a 2D vehicle silhouettes which are bespoke to whatever vehicle you are actually likely going to encounter. In this example you would see Australian Abrams tanks, for example, fighting vehicles that they are mostly designed to target and engage. You would see most eastern bloc kind of vehicle sets. You could have relic vehicles going from the '60s all the way through to new high-tech, dangerous enemy tanks, which we are likely to start sneaking in the battlefield in the next five, 10 years for example. They all look different and trying to train people to look for a specific enemy to understand the threat of what that vehicle looks like and what that one looks like, but the one on the right is the one that is of the greatest threat. It has a longer range. It has EW capabilities. It has things that you need to target because that vehicle is the real dominant threat, but if you're not looking for it or learning all the time, what your enemy is and what they look like when you do come face to face with them and hopefully we don't, but if they ever do, then there will be a delay, there will lag in the time it takes for them to engage. It's first mover advantage, it's basic game theory. It's about you need to strike before your adversary, otherwise you're going to lose that advantage and then you lose the initiative. Once we start losing assets, it just rolls down hill. Phil Tarrant: That's at the 2D level. The 3D stuff or the robotics stuff, how does that work? Steen Bisgaard: This is where it gets really creative. We take the blueprints of whatever vehicle set that someone requires, and we make an exact to scale full size metal vehicle. It's modular flat pack is down, so it's easy to transport, if you get it down on the range, you can assemble it with two or three guys in about five to 10 minutes for the static, and then for the robotic. You attach the robotic system and from there you can create really complex live fire enemy situations and you can also create battlefields where you'll have friendly vehicles which are a mock up of a friendly vehicle based on the same design principle. Then you'll have your enemy force and you'll put them in a battle formation and now you can have either naval flyers targeting the enemies or you can have your air force coming in and they can be doing danger, close missions and you can have a real chaotic battlefield established for the first time. Traditionally, we haven't been able to do that or no one's been able to do that because the threat of danger close and fratricide occurring where we actually accidentally target our enforces. It's not worth the training risks. Now we're going to establish these large scale scenarios and we can do it with zero risk to the friendly force because we can ensure that the area is clear, but it looks like to the guy who's in the air or the UAV asset that's looking for it. It looks like the battlefield is there and it's moving and it's chaotic. Now we can really box in and work out, or did we hit the right one? Did we target at the right point? Where are our assets stacked? Did we achieve the effect that we meant to have with all these brilliant weapons of war? Did we actually do what we meant to do? If we didn't, then we can replay why we can go back, we can learn, we can look at the data, we can work out, you didn't identify the right vehicle, you didn't identify the right time to strike. The people are now getting trained, they know how to use the asset, but now they know how to apply the asset. Phil Tarrant: How many other guys or girls in the business? It's good to embark on a new business venture with some good structure in place. It will always change in the future but how have you gone about funding to the point where you are right now as being your own money, or have you written some sponsors? Steen Bisgaard: At the moment it's three of us. I'm the founder and we are looking to expand and really try and bring more on as we go. It is just trying to work out the target audience and get some contracts locked in so we can. So we have one ex air force and an ex army. So we're looking to use veteran experience, people who understand the problem set to create the value to help the next generation of guys and girls who are going to be put in harm's way. Yes. It's all been personal investment for the firm today, and that was so that we could get the company into a position of strength. Too many times I've seen firms go out and they look for investors quite early that they start to erode their ownership too early, and so the product that comes out is no longer a product that they can aggressively deal with larger investors. We realised quite early we didn't actually need that much capital in order to create what we needed to create. Then over time we were able to inject some more, and now we're at the point where we have a good product. We're an established firm and we have manufacturing ready in Brisbane. We have a process for sales, we've just been recently accepted onto Team Defence Australia, so we will be looking for international roadshows next year to get our products out to the world. Phil Tarrant: You're moving into that production period and you can start scaling the business. How do you know that what you've created, someone actually wants it, so in Australia that would be the Australian Army, no doubt or the the Air Force, and then to take that internationally would be other armed forces? How do you know, how did you test that this is a product that someone actually needs? Steen Bisgaard: This was the risk I think, starting up as a firm with only myself and a couple of people and trying to go, 'OK, how do we make this, what is it really going to look like?' It came back to what do we know that we need? What is the one thing in the last five, 10 years that I have personally known that I've actually needed for the training? Having had that experience, having been there in a month, outfield, and having done live fire battle day after day, I know the training shortfall that occurs and I know now that we've solved it, so that's how I know that there's a market there and it was a risk, it was a massive risk putting your name to something that can close up shop on one career, there's an opportunity cost there and then you look for something else which may not work or it might, but knowing that there was a shortfall there and realising that that shortfall isn't just in the ADF, it's global then makes me realise there's definitely a market there and we're getting a lot of interest already. This is our first product line, which we believe will be a good example of the skillsets and the knowledge that people have. It captures the experiences that are quite recent, but then there's other experiences that we have identified as well from operational deployments or from other areas in the ADF and people's experience where there's harder problem sets that we'd like to get into, but that's further down trail. The full podcast with Steen Bisgaard of Gaardtech is available here.